Now is the time to get your creative juices flowing! Anything that you can do yourself is the best way to save money. As you probably know by now, we love Pinterest for things like DIY wedding décor. You would be surprised how many ideas Pinterest has for wedding decorations that you can do yourself and make it look like you paid hundreds of dollars. Take these flower centerpieces for example. You can make these as fancy or casual as you want, but they are completely DIY and cost far less than if you had a florist construct centerpieces for you. All of the items you need to make these you can find at the dollar store! Head to your nearest dollar store, pick out fake flowers that match up with your color themes, hot glue the bottom of the flowers to tall glass vases. 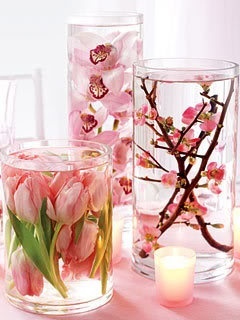 Fill the vases with distilled water and add tea candles to the top for some elegant lighting! Take advantage of discount websites such as LivingSocial or Groupon. You’d be surprised the kind of deals you can find that are fitting for a wedding. They have things like deals on a wedding photographers (which can get pretty pricey) and deals on hair and makeup. Granted, you’re not going to get a full on 10 day trip to Cancun for $100 for your honeymoon, but hey, take what you can get! Every penny you can save counts! We get it. Saturday evenings are the most popular day of the week to have a wedding. But guess what, everyone wants to have their wedding on a Saturday! If you’re open to having yours on, say, a Friday, most wedding venues will give you a discounted price since those days are not as popular. And who says a Friday night wedding isn’t just as fun? It is something different, it’s still a weekend, and you get it for a cheaper price… everyone wins! Every bride (and groom) deserves a little splurge. It is, after all, your wedding day. The trick is to choose where you want to splurge. Be it your dress, the food, the venue or the honeymoon; focus most of your money into that specific part of your wedding. The other aspects of your wedding you can find loopholes to save some money! If you decide to go big on your wedding dress, think about finding an inexpensive catering company to do your food, or better yet, make your own food! (If you can manage making food for the number of guests). If you have a friend who is in the catering business (or a photographer, or event planner etc.) see if they can help you out on getting you a good deal… a free or discounted photo shoot for your wedding can never do you any wrong! For some brides, this may be out of the question. “Sorry Aunt Margaret, you and Uncle Bill can’t come to my wedding for expense purposes.” Ok, we’re not saying cut out important family members from your invite list. However, if you’re going for a lower budget wedding, keeping the guest list short is key. Invite your closest family and friends and anyone you can’t imagine not being a part of your special day. Don’t feel bad about leaving out those people that you may feel like you have to invite (co-workers, your parents friends etc.) The less people at your wedding means the less people you have to feed, which is a huge money saver! We hope these money-saving tips can help you budget your wedding… as always happy blogging!